While Angler Qwest pontoons are great for taking out friends and family all at once, for a sunset cruise, don’t let the pontoons fool you- these rigs fish! The boats are available to target several species, including the Troll series, that comes in six models from the 820 series, that has a max horsepower rating of 90, all the way to the massive 824 model tri-tube, that sports an aircraft carrier-like eight-foot x 23-foot deck size, with up to a 250-horse power outboard. Anglers no longer have to settle if they want a rig that is family-friendly but can also take on rough weather while trolling the Great Lakes. 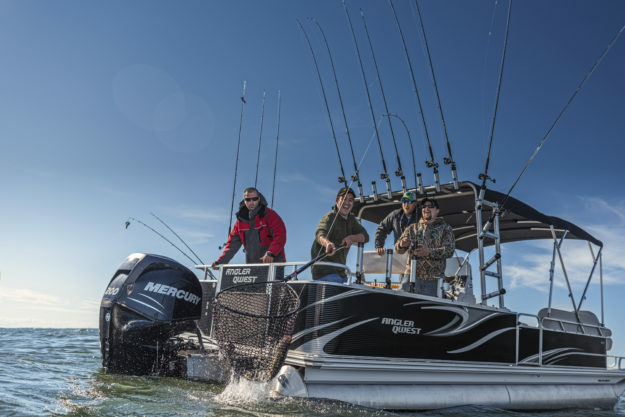 Brad Dupuie, Angler Qwest Product Manager, said that the brand was built because the industry was lacking a pontoon boat that fished as well as it cruised. 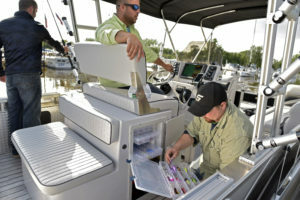 At the helm, anglers will appreciate the state of the art fiberglass center console that accommodates today’s large sonar screens, as well as a custom gauge panel with tachometer volt gauge, and 10-switch rocker panel. A large storage compartment is handy, and a five spoke stainless steel steering wheel, exudes the quality that is hand-built into every Angler Qwest model. While there are a ton of awesome interior features like a deluxe Captain’s seat, and rear facing upholstered storage bench- what REALLY sets the boat apart is the exclusive Binary Rear Wall System. Even more seating is seen in two, 45-inch front bench seats on the 820 series (up to 70-inches on the 824 Pro), plus front layback seats and storage. Several rod holder assemblies are available depending on the model that suits your specific needs. As for the exterior and hardware, quality is seen throughout each model from the double Bimini top system, rigid dent resistant panels, robust aluminum rear entry ladder, and either a durable vinyl deck or full teak flooring. When it comes decide on what to put on the business end of the Angler Qwest, the motor is determined by the manufacturer YOU want to see powering your rig. The above represents a fraction of all that can be done to an Angler Qwest pontoon that make them the best fishing, and pleasure boat, ever to take float.